Feeling Whisky is getting overpriced? Fear not, premium rum is still largely undiscovered. Previously we had a Rhum Agricole from Berry Brothers, that is to say a rum distilled from sugar cane juice instead of molasses, which is the French style (a generalization). Here we have a Guyana Single Rum from Port Morant (Mourant), this is the Demerara style of rum, named for the river in Guyana and not the sugar. It is instead distilled from molasses as is typical of rum produced in the anglophone Caribbean, though Guyana itself is on the mainland and not an island. Coming from the world of whisky, one may be amazed to discover that this rum was distilled in wooden stills heated with steam fed pipes, the wood is said to play a similar role as copper does for whisky. 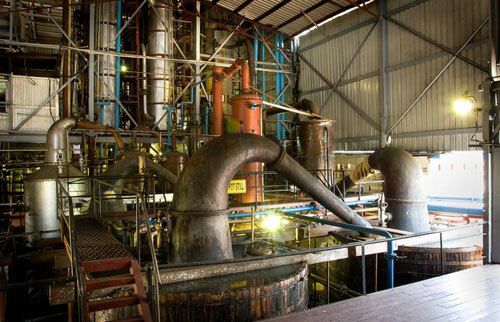 The Port Morant distillery itself no longer exists, as the region’s many small distilleries merged into a large company named Demerera Distillers Limited, with a single distilery named Diamond. However the Port Mourant wooden stills were moved to the new premises and continue to operate there. 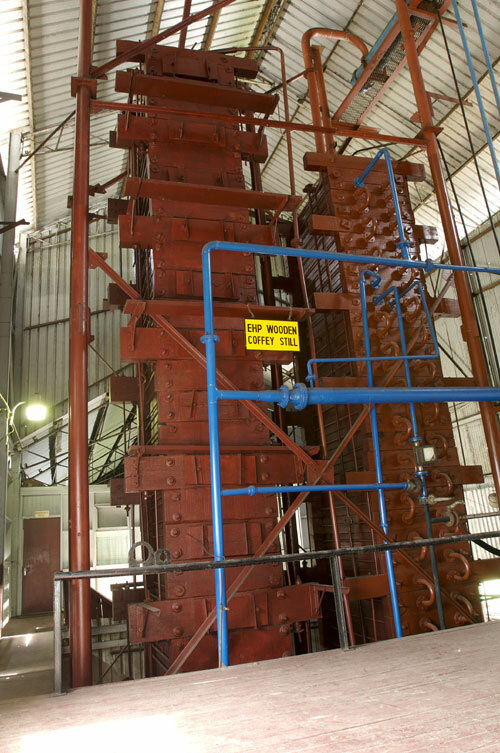 (Official picture from the DDL website) Note the wooden bottoms and copper tops. This particular rum can be purchased from the folks who run whiskyauction website, I know it is a Single rum being from the old Port Morant, but as for the kind of wood it was aged in and such, one can only guess. Nose: Thick and pungent! Bubbling black molasses, loads of toffee, tar, soy sauce, swedish bitters (a sort of herbal tonic mix rubbed into bruises and fevered foreheads by well meaning aunts – with dubious claims of Scandinavian origin). Old leather cut into strips and blended with flavoured salt, lots of licorice, and a very fribrous vegetal strand, like standing next to the waste pile at your favourite sugar cane juice stall. Also red cherries and dark chocolate. Guess you can tell that it is a very ‘dark’nose. With water: No change, maybe a little zestier. Palette: Hints at being sweet without actually being sweet, slight toffee flavours evaporate almost instantly with the arrival of this big soy sauce saltiness, and big tar-like medicinal earthiness. Huge mix of clove, aniseed and licorice cocoa flavours arrive. With water: No change. Finish: Long, fibrous with a green tang. More salt, echoes of spices. Its a huge rum with huge flavours, I’m not sure I can taste Laphroaig after this. Still a fantastic drink if only a little monolithic. Still, having almost no experience in rum, that arrow should just be ignored. Hey Lewis, you’re quite right, there is some difference in the regulations on age statements for Rum in the US as opposed to Europe. I think in Europe a blended rum may bear the age of its oldest constituent, but in this case, as this is a ‘Single Rum’ with a vintage, I do believe it is an unblended rum of that vintage and age. Yes tropical angels drink a lot, I’m just amazed that there is any rum left after 32 years. Those were good points, thanks! This entry was posted on November 11, 2014 by Whiskyrific in Port Morant and tagged Port Morant, Rum.